Recently I had the pleasure of having lunch with a lovely lady that I know and she told me a wonderful tale and I want to share it. Grace was a very timid and quiet young lady who worked hard and got great grades. Towards the end of the year with the whole class caught up in a series of exciting events, it happened that they all forgot to complete their homework. This was something that Grace had never done before. The next morning, when her teacher, the venerable Sister Mary Magdalene, asked the class who had completed their homework, when no one raised their hands they could see in their teacher’s face what was coming next. 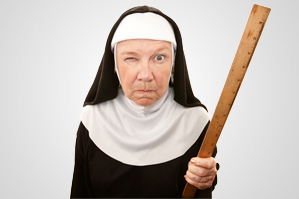 Decisively, Sister Mary Magdalene made the class all line up and first took the boys off to the changing room where she administered a rapid Corrective Action Plan. One by one the boys were paddled for their mistake and one by one they came out with red faces and a few stifled tears. Grace stood there watching and listening, growing more and more apprehensive; but as scared as she was she didn’t need to worry, as once the boys were dealt with the girls were simply marched back to the classroom with the paddled boys in tow. “That was the day I became a project manager! I have never missed a deadline since!” she said, grinning from ear to ear. After the humor, the reality is that much like the “All I really need to know…I learned in kindergarten.” – Robery Fulghum. Link: Life is a Project.